The newest item on the Wendy's menu is the limited time Bacon Maple Chicken Sandwich. 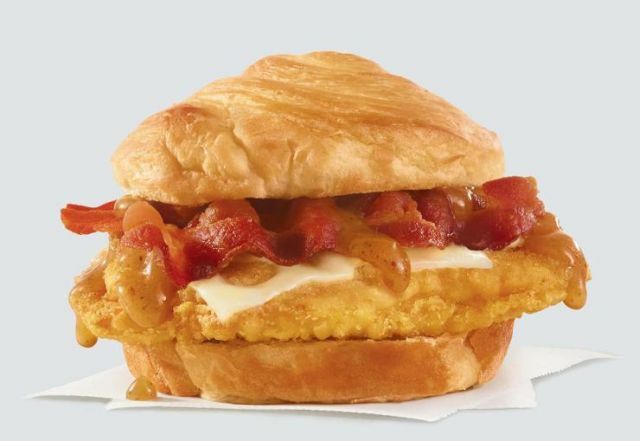 The sandwich features a maple glaze, a crispy-fried chicken breast filet, Swiss cheese, and three strips of applewood-smoked bacon on a toasted croissant bun. The chain was spotted testing the concept since about two years back in 2016. The Bacon Maple Chicken Sandwich carries a suggested price of $5.60 (it goes for $5.99 here in Los Angeles.